In order to use a synchronization utility to sync two Macs, one computer must be able to access the other's hard drive. On a Local Network The easiest way to set up file sharing is with OS X's built-in file-sharing feature. To turn it on, open the Sharing preference pane and select the File Sharing option (see "Sharing Preference Pane"). Click on the plus-sign (+) button under Shared Folders, and select a folder or volume to share; note that you'll be able to synchronize only items within this folder or volume, so you'll likely want to choose your user folder. Your name should appear in the Users list with read and write access, so you can use your own user name and password to log in to this computer from another Mac. To enable another user to connect with a password different from yours, click on the plus-sign button under Users, select an existing name or click on New Person, and enter a user name and password. Now, on another Leopard-running Mac, look in the sidebar of any Finder window; the computer you just activated file sharing on should appear under Shared. Select that computer's icon, click on Connect As, and enter the user name and password you set up for that computer. Once you're connected, double-click on the name of the shared folder or volume to mount it-the other computer's files should now be visible to any synchronization utility. 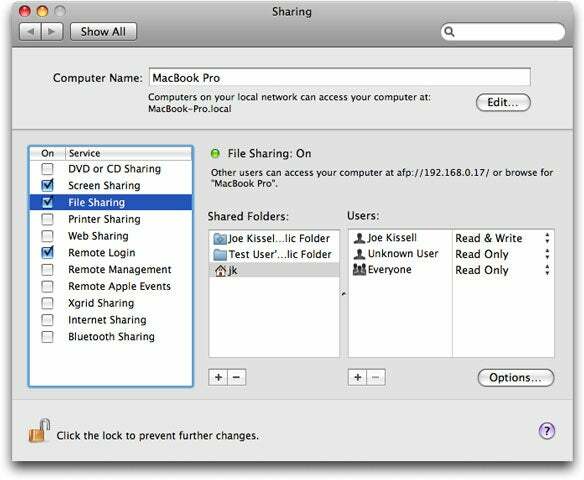 By adding your user folder (or another folder) to the Sharing pane, you can make it available to other Macs on your network. Over the Internet-Back to My Mac Accessing another Mac is trickier when the two computers are not on the same local network. If you're a .Mac member running Leopard and you've activated Back to My Mac (via the the .Mac preference pane's Back To My Mac tab) on each computer, you should be able to see your other computers even when you're on different networks (say, one computer at home and the other at work), though you may have to configure your router or firewall to enable outside access. (Apple provides detailed usage and troubleshooting information; check it out if the feature doesn't work as expected). Over the Internet-Other Options If you're not a .Mac member or you're not running Leopard, accessing a Mac remotely requires more effort. One approach is to use a VPN (virtual private network). For example, if you have file sharing turned on at work and you connect to your corporate network from home via a VPN, your work Mac's volume should be accessible as with a local Mac. Going in the other direction (accessing your home computer from work) without a VPN requires that you know your home Mac's public IP address. (To find this out, open a Web browser on your home Mac and go to whatismyip.com. If you don't have a static IP address, try a Dynamic DNS service such as DynDNS (basic service is free) to assign a domain name to your home Mac; then the included software informs the company's name servers whenever your Mac's IP address changes, so you can always connect using the domain name regardless of the current IP address. In addition to knowing your home Mac's IP address or domain name, you may need to set up your router to use port forwarding, in which all requests from outside your home network directed to a particular port (such as 548, the one used by AFP for file sharing) go to a specific computer on your network. You can learn more about setting up port forwarding at PortForward.com. Once you have port forwarding configured at home, go to your work Mac and choose Go: Connect To Server in the Finder. In the Server Address field, enter afp:// followed by your home computer's IP address or domain name, and click on Connect. If everything goes well, your home Mac's drive will mount in the Finder. If All Else Fails If you lack the geek mojo to work through all those details but you still need to sync, say, a home computer and a work computer, consider a slightly lower-tech alternative: an external hard drive that you shuttle between locations. You can either use the drive to store all the files you need to access in both places, or synchronize your work Mac with the drive before and after switching locations.